Altered Symmetry is a promising young, but not inexperienced, progressive metal band from Bogota Columbia. Prior to this year's full-length debut, Prologue, they cut three EPs, including a 'cover' album. This disc applied some prog nuances to the likes of Billy Idol (Rebel Yell), Aerosmith (Toys in the Attic), and Bon Jovi (Born to Be My Baby). This alone should spark some interest in their creativity. Above, Altered Symmetry: vocalist Arly Gomez, center, is close to getting wet feet. The broader canvas of Altered Symmetry's music is progressive metal, with notes of and nods to traditional heavy and power metal. Their influences have been Rush, Queensryche, Dream Theater, and Metallica among others, so expect some clever arrangements and skillful musicianship. To lyrical content, though not uncommon among the more 'thinking man's' prog, Altered Symmetry looks more to literature, penning songs inspired by Dickens, Herman Hesse, Anton Chekov, Poe, and Michael Ende, author of the Neverending Story. Again, this things should encourage more than a little interest, and it's well worth it. At times Altered Symmetry can be quite heavy, even quick in moments, as on Slave Without a Master or Walker. Then they'll surprise you with the acoustic guitar driven A Day that Changed All, which has a near lullaby feel to its composure. This song also speaks to the fine guitar work of Miguel Martinez that is rather impressive throughout. Another interesting switch is the more melodic and progressive rock of the opening track, Life Sentence. But, of course, when taking cues from the likes of Queensryche and Dream Theater, you need to be both intricate and somewhat epic in your composition; you'll find this in The Longest Journey and Lies and Fairy Tales. In the end, there's much to enjoy here with the expectation that the songs are both diverse and interesting. Perhaps my only dilemma was with Arley Gomez's vocals which neither captured my interest or necessarily pleased my ears, except in lighter moments like within Long Lost Love or in the acoustic arrangement of A Day That Changed All. But, this observation should not discourage anyone from checking out and enjoying this fine album. 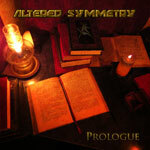 Prologue demonstrates Altered Symmetry's exceptional skill and inevitable promise in the progressive metal field. Even greater things lie ahead.